← Canon Boy & Nikon Girl – True Love?! These are very exciting times for photographers. Admittedly, if the recession wasn’t on, it would perhaps be even more exciting as we would be able to afford these things, but nevertheless, in the past few months there has been a range of great cameras announced. The first of these, and the subject of this review, is the Olympus E-P1. This is the first in a new genre; the micro four thirds non SLR interchangeable lens camera, which was announced earlier this year on June 16. Its a great little camera. In a nutshell, it has a 12.3 Megapixel sensor, shoots at 3fps, ISO range of 100 to 6400 and has a built in IS system. The camera was launched with two lenses; a 17mm f2.8 pancake (equivalent of 34mm) and a 14-42mm f3.5-5.6 (equivalent 28-84mm). I first got to play with the camera for a couple of hours in June, and this first brief encounter left me smitten. The E-P1 was everything the Leica M8 should have been. I have yearned for a proper digital rangefinder since switching over from film and have been disappointed by Epson and Leica’s attempts. Having tried the M8 twice, alas it was clear to me that it just wasn’t for me. The sensor’s cropped size, terrible performance in mid ASA’s upwards and need of extra filtration has put me off for good. I really wish that they sort out these shortcomings instead of just focusing on limited editions and luxuries like mineral crystal LCD covers. However, a lot has happened since then. On September 2nd, Panasonic announced the very interesting Lumix GF1, which like the Olympus is a micro four thirds camera with interchangeable lenses. Interestingly it has an optional electronic external finder. Having had a Leica Digilux 2 for several years, I’m used to this type of finder but not necessarily a fan; on the Digilux 2 fast panning movement would cause streaking and lag. I’m looking forward to testing the Lumix GF1 to see how its electronic finder works. Leica also announced the M9 and X1 (which appears to be a Lumix GF1 but with a fixed lens and different body) on September 9. Although I have yet to test either of these cameras, apart from its price point, the Leica M9 looks like it just may be the camera to get Leica back into the world of working photographers. To add to these, Canon announced its G11 on August 19; whilst it differs from these cameras by having a fixed zoom lens (equivalent of 28-140mm) and being firmly in the compact camera category, it promises to be a great tool as it has thankfully left behind the megapixel war and concentrated on image quality, whilst being based on the very user friendly and sturdy G10 chassis. 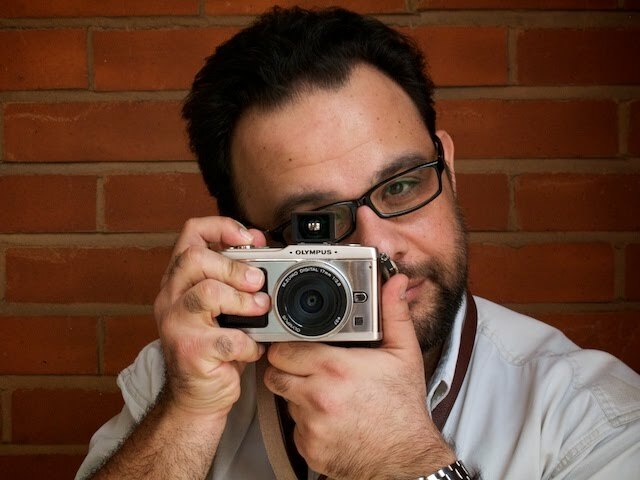 Whilst at launch, the Olympus E-P1 was totally unique and literally in a league of its own, it now faces some tough competition. The camera has a fantastic feel to it. It’s solid and well built and for weeks I’ve had it on my shoulder. Its feel just encourages you to pick it up and take pictures. Eclipsed by only the Canon 5D MkII, I’ve never had a camera that has piqued the interest of my colleagues so much as the E-P1; on any type of gathering, it has instantly been the topic of conversation. As my colleague Jonathan Eastland pointed out in his technical review (BJP 29.07.09) one instinctively brings the camera to the eye; alas there is no viewfinder and the rear screen is used much like any digital compact camera. Thankfully there is an option of an external optical viewfinder, the VF-1, which is matched to Olympus’ pancake 17mm lens. This tiny little accessory changes the camera completely. Olympus had difficulty in getting the VF-1 to me and for several weeks I carried the camera to jobs and couldn’t use it. I am of the school where a camera is raised to the eye and not kept at arm’s length. After this initial period I was very close to calling the camera a flash compact camera that had interchangeable lenses. However, fitting the viewfinder makes it a very useable tool. I generally put the camera onto centre spot focus and could more or less guesstimate where the point would be in the external finder. This system works very well, both in terms of speed and accuracy and only failed on a small percentage of shots. Whilst the camera is generally fast to focus lock, it does rarely just take so long that the shot passes you by; as I mentioned though, this was for a small percentage of shots. Another focusing mode which worked surprisingly well in combination with the external finder was face detect; this would recognise faces in the composition and rather accurately focus on them. Although the VF-1 is a snug fit, it needs a lock. To take this external viewfinder system to the next level, it would be fantastic if it incorporated some electronics in the form of focusing spot points, focus lock indicator and exposure values. However, as things stand, the only four thirds lens with a matched external optical viewfinder is Olympus’ offering as reviewed here. Panasonic is launching a great looking 20mm f1.7 (equivalent 40mm) pancake lens. As Panasonic’s viewfinder is electronic, there is no matched optical version. My thoughts are that for this camera to really work and be useable, there needs to be a set of prime lenses with matched external optical viewfinders. My personal wishes would be for a 24mm or 28mm, 50mm and 85mm lenses to be added, all with their own matched finders. Ideally, the current 34mm pancake lens will also be replaced with an f2 or faster version. Whilst the silver version of the camera I have been reviewing looks great, the only other option is white. I have yet to see this in the flesh, but it does look great in the pictures. What’s really desperately needed is a black version. The 14-42mm f3.5-5.6 (equivalent 28-84mm) zoom lens is a surprisingly good performer in good light. Its tiny size meant that I had it with me for “just in case” situations. Naturally this lens has to be used with the rear screen as there is no zooming external finder available. I must admit though, I was smitten by the little tiny 14mm pancake lens which is smaller even than my Leica M lenses. Its a fantastic performer, producing sharp, contrasty images full of colour. Flare was very well controlled too. My only wish, as mentioned before was that I just wish it was faster than f2.8. Unlike the Panasonic GF1, the E-P1 does not have a built in flash. Olympus however do offer the dedicated FL-14 flash. Like the camera, its very well made and feels solid. In use, it has a tendency to occasionally over-expose the first shot and then is fine for remaining shots. For its size, and considering it uses two AAA batteries, its amazingly quick to recycle. Using it on aperture priority with slow shutter sync enabled produced some excellent and very well balanced results. This camera performs rather well in higher ISOs. Its never going to come anywhere near a Canon 5D MkII for low light work, but as far as Olympus cameras are concerned, it does do an extremely good job. I did a whole series of shots from 100 to 1250 ASA, and all of the images impressed. 1600 and 2000 ASA were usable, and anything above is really for emergency use. The fact that the camera has IS and the 17mm is f2.8, does mean that you can work in pretty dim situations. The camera has a 3fps motordrive which is pretty impressive. It’s very responsive and the drive speed makes it very usable. The unfortunate thing is that the camera is very loud. It’s not even the drive; the shutter is just too loud, even on a single shot. Considering there is no mirror to move, the camera should be much more quiet. The main use I put the camera to, especially when the finder finally arrived, was street photography. It just seems to be in its element on the street. Although it was shiny silver, the size meant that it could be easily hidden and taken out for a picture. I found it very usable and really enjoyed making pictures. It just so happened that when on most of my news assignments, although I had the camera with me, I didn’t use it much. This was purely down to not having the external viewfinder yet. So, who’s this camera aimed at? It’s not a compact and not an SLR; think of it as a modern day rangefinder style camera. For me, its ideal for features, reportage and street photography. However, its usefulness depends on the lenses released in the future. These need to be fast prime lenses with matched external viewfinders. Newer models really need to be much quieter (I’ve used DSLR’s which make less audible sound). But even with these improvements, it’s not all clear cut; the offerings from Canon, Leica and Panasonic will need to be considered. Having said that, I congratulate the birth of this new format and wish it longevity. This entry was posted in Camera Equipment, E-P1. Bookmark the permalink. Hi Ed, just wondering if you've tried the Canon EF lens to micro 4/3rds adapter on the E-P2? If so does it have any effects on the image quality and how does the Ziess 50mm (equiv 100mm) look on it? I'm thinking of getting the E-P2 for the wife's 30th. I have a converter for EOS lenses and the quality is stunning as it uses the central part of the lens. However, you should remember that it will only allow you to shoot wide open as there is no way to close down the aperture. With Nikon AI and AIS, Olympus OM, Leica lenses, you can stop down using the manual aperture ring (I'd suggest after focusing wide open).The Zeiss 50mm f1.4 looks sweet on it too! !Lastly, I'd definitely recommend getting the optional viewfinder, especially if you're going to be using manual focusing.